Written by Ivana McConnell on January 24, 2018 . Say your app connects volunteers with local charities in need. You want to send a message to your volunteers every time a new charity in their locale puts in a request for volunteers. 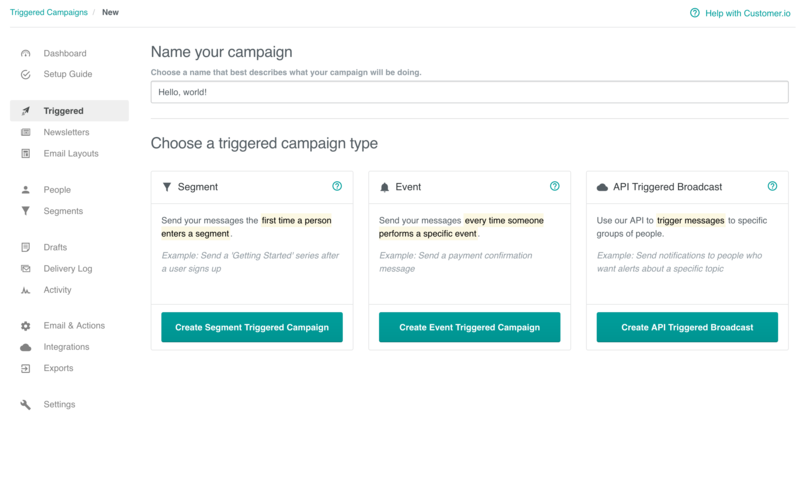 With API triggered broadcasts, you can send new requests for volunteers, as they come in, to everyone in a specific area and send those messages over any medium like email, SMS, or push. When sending news or automated updates to groups of people, there’s no reason that these broadcasts can’t be just as relevant as the rest of your Customer.io messaging. Introducing API Triggered Broadcasts from Customer.io! 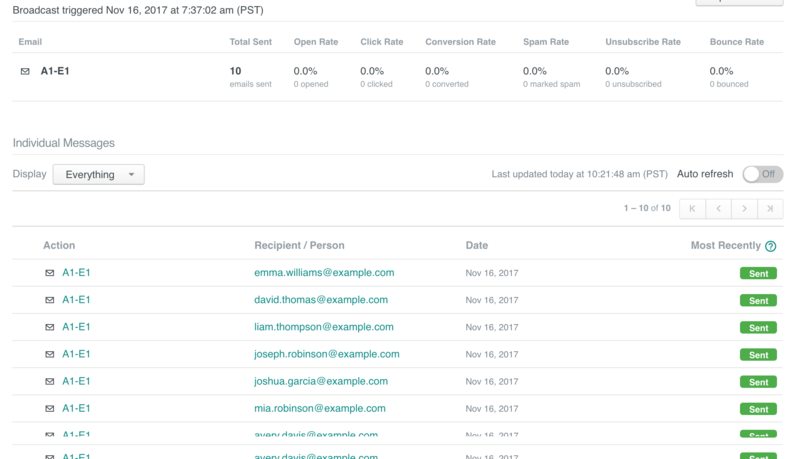 With this new campaign type, you can automatically send one message to many people quickly in response to an API call— but still use up-to-the-moment data to personalize it. This way, you set up your campaign and messaging once. Then all you need to do is set up your API call and you’re good to go. Read on to learn more about this new campaign and how it works. We’ve also got a video for you! for messages that recur frequently, with a similar structure but with different data. You can use Liquid to leverage user data in API triggered broadcast messages, as with other campaigns in Customer.io, but here’s where a little extra flexibility comes in. Those attributes can be combined with structured data sent from your app that you’ve associated with this broadcast. 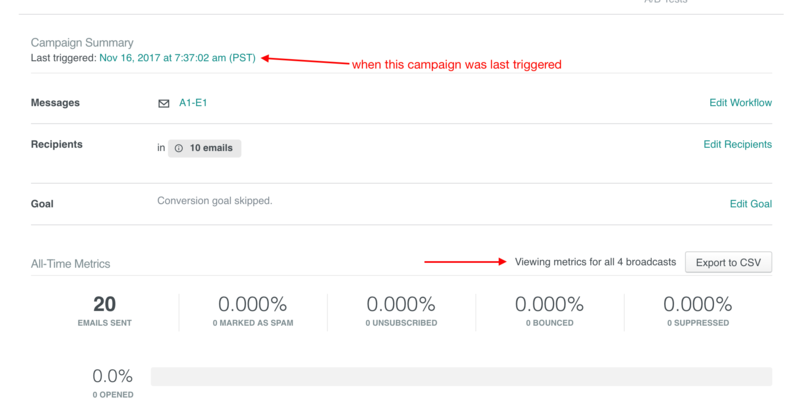 Once you set up a campaign, it’s not started; rather, it’s “activated” and waiting for you to let Customer.io exactly when you want to send it, and with which data! That way, the moment you want to send, you can trigger the broadcast via our API, using that campaign’s specific ID. Using this ID, you can send us an API call that triggers this broadcast, dynamically defining your recipients and data at the moment of send, keeping the flexibility and control that Customer.io offers. We’ve written extensive docs on both how to trigger this, as well as how to integrate with our API. "text": "We've received reports of a roadrunner in your immediate area! Head to your dashboard to view more information!" There’s tons of power in this, so we’ve documented it for you here, so you can be sure you’re formatting the data in the right way. Need someplace to get started? We’ve made an intro video for you! You can also check out our walkthrough of how to set up an RSS feed email campaign using API triggered broadcasts and Zapier to automatically sends new blog posts to your audience. Too often, when we send mass notices via email or SMS, personalization loses out in favour of expediency. We want you to be able to use Customer.io’s message-programming powers for these larger audiences, too. Want to test a couple variations of a broadcast to find out what works best? Send broadcasts via SMS or Push? Send a specialized email to your most loyal customers whenever you’ve updated your inventory? API Triggered Broadcasts open all of these doors. This is a brand new campaign type in Customer.io, and we’d love to hear how you use it, as well as what you might like to see from it in the future! Any and all feedback on the feature or its documentation will help us make it better. If you’ve got questions, feedback, or need a hand, we’re here for you win@customer.io!